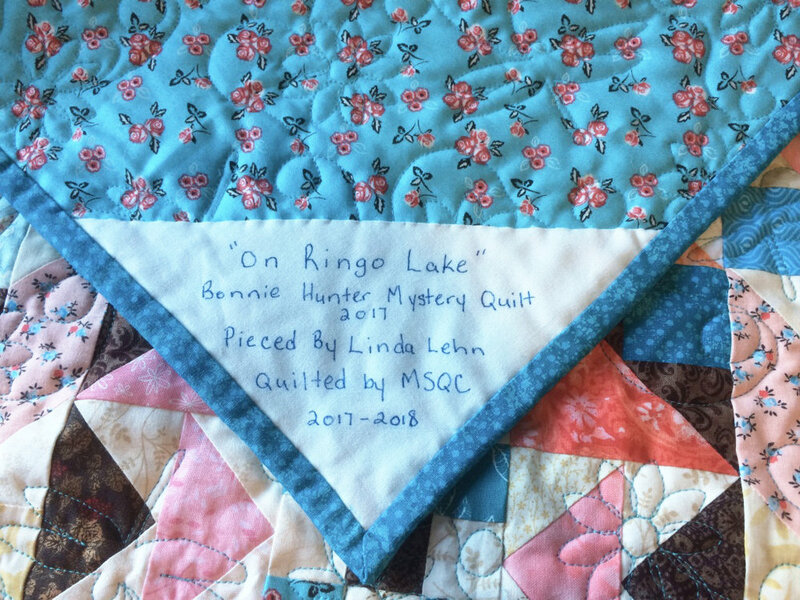 If you follow much quilting at all on on the internet, you will be familiar with Bonnie Hunter and her Quiltville blog. Every year for the past 9 years, Bonnie has hosted a mystery quilt during the Holiday season. Every week, beginning with Black Friday, she posts a new clue and all of the instructions on how to complete it. I participated last year for the first time and I have to say that I am now hooked. It was a TON of little pieces and the quilt was BIG, at least for me. I don’t usually make them any bigger than a large lap size, maybe a twin size if i’m feeling ambitious. This thing was nearly a full size, so it was a real stretch for me. It almost fits our queen bed, if it had just a little more drop to the sides, we could use it for our bed quilt. I wound up sending it to a long arm quilter to complete the quilting, which was another first for me. I just didn’t want to wrangle that huge thing on my machine and risk messing up the quilting after so much work putting it together. I chose to have it quilted with flowers and dragonflies by Missouri Star Quilt Company. The price was reasonable and it turned out much better than it would have if I had tried to quit it myself. All in all I am really pleased with how it turned out. Miss Aeris seems to have given it her approval, too and that is so VERY important.